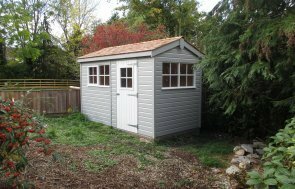 This attractive 2.4 x 3.6m Superior Shed is fully equipped for year-round use, and has been installed in our customer’s garden in Melksham, Wiltshire to use as a hobby workshop. The roof overhang over the front gable will help provide some shade and protection for the door and window, and there is black guttering on the right-hand side of the shed to protect the three windows from excess rainfall. Our heavy duty felt has been used on the roof, which is heat-bonded on to ensure a more durable, waterproof layer is created, and the outside of the shed has been finished off with our Valtti paint system in the neutral colour, Pebble. Valtti is a multi-layered, opaque paint system that comes in a range of natural colours, and has a long re-decoration cycle for low maintenance. Features that make this building perfectly suited to prolonged or year-round use, include the double glazed windows, full insulation (walls, ceiling and floor), oak faced ply lining on the inside walls, and an electric pack. A security pack has also been installed to give the customer peace of mind that their possessions are going to be kept safe inside. This security pack consists of a seven lever lock and heavy duty sliding bolt, security screws for the door hinges, and stainless steel window bars. There is also a 3.6m long workbench situated underneath the windows in the right-hand side to provide the customer with a sturdy surface to work on. Contact Us online, call us on 01760 444229 or you can come and see our quality timber buildings for yourself at any one of our six Show Centres across the country.